Outdoor Weddings – Tips & Tricks! As a wedding planner, there are lots of details: the flowers, the caterer, managing the bride(s) & groom(s) and the entire guest list.. It truly never ends for us until the party is over and the guests have departed. A commonly overlooked detail that for outdoor/destination weddings we can’t help but emphasize is the importance and need for alternate options and plans to an outdoor ceremony. On any day, in any city could provide extreme weather scenarios that are unanticipated and negatively impact the course of the day. Why add more stress to the day when you can prepare ahead of time. Although this may require some additional funds, this will outweigh any concerns on your wedding day so you can fully enjoy! Here’s some of our options for tips & tricks with extreme weather..
– Fan Programs: this could be a fun way to have guests use this as their best accessory! They can fold it like origami! These can be easily found on a site like etsy.com. – Parasols: get creative with this! You can use colors to complement your overall wedding theme, use a picture of the couple or provide markers where guests can write fun notes on them! Other things to consider providing your guests: sunscreen, blotting tissues, face mist, (the mini Evian face mists can be left on a table for people to pick up or in the bathroom) and insect repellant (especially for the mid-summer or outdoor ceremonies in the woods or a more rustic locale). 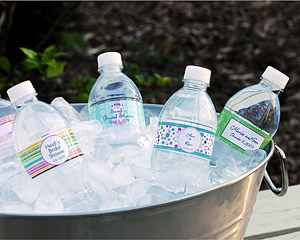 – Water Station: this could be providing guests with mini water bottles (and do specialized wrapping) or leave a large water jug with cups and hand towels next to it. [You can add a larger beverage station here with drinks like lemonade, iced tea or for indian weddings some mango lassi!] NOTE: you should avoid strong alcohol and drinks that can spoil in warmer weather..
– Cold snacks: let your guests snack on some cold treats like ice cream / sorbet, fruit bars or a gazpacho! Adds an extra hint of color to the day! Though, be mindful to keep stored at cool temperatures and have people hand out VS leaving out to melt. – Tents: provide a tented area such as a cabana tent in case for extra shading. Also, considering the time of day that you’re planning the ceremony can help as well; The later the ceremony, the easier time you may have to avoid the mid-day heat. – Umbrellas for your guests: leave them by the beginning of the ceremony aisle with big containers to put already wet umbrellas. Another fun idea is to provide rain ponchos for guests and they can have a picture of the couple or the date of the wedding. – Tent with marquees/walk-ways: provide a place for people to stay for the chance of a surprise rain shower. We recommend avoiding using materials that people can easily slip on. Also, make sure to make signs that are legible and with materials that won’t wash away in extreme rain/snow. – Event Insurance: in case its extreme weather and the event gets cancelled. There’s always a “what if” scenario and you’d rather be safe than sorry! – Transportation: keep an extra eye on how the day is going. Guests may be coming from a hotel or out of town. Suggest carpooling with other guests or ask ahead of time at the hotels guests may stay to work through providing some transportation options. – Rain cards: when sending invitations, you may have already considered a rain plan. This would be a good time to inform your guests of these plans so everyone can consider their choices for attire, transportation, etc. – TAKE PICTURES! 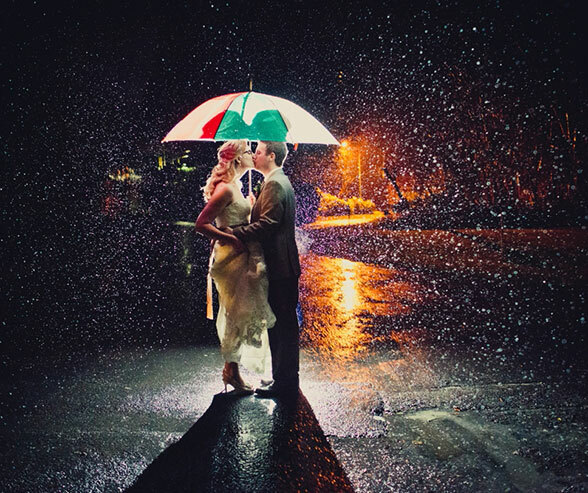 Rainy day weddings usually produce some of the best photos. Be creative and keep lots of color (umbrellas, rain shoes). Depending on your location, you may require additional permits and permissions based on the grounds. Do your due diligence as well as speaking with the venue to discuss your options! Most importantly, make sure to HAVE FUN! It is your wedding after all.. Things happen that are out of your control and making the most of the situation will be most important. Don’t get caught up in the small things and enjoy the day! Also, thanks to Martha Stewart Weddings and Colin Cowie Weddings for also providing us some helpful tips!